traditional closing party – Dancing till we drop at 4 AM. This year’s theme is, as Colin said, All FOR LOVE! After all, isn’t everything we do done for love? Opposites attract, and unlikely couples are often meant to be. Love is seldom effortless, and failure can be a part of the love. of love inspire your costume. Or get inspired by these lovely examples! THE BEST “ALLFORLOVECOUPLE” WINS A SURPRISE!!! We’ll be ending IMPRO Amsterdam on Saturday, February 2nd with our traditional closing party - Dancing till we drop at 4 AM. 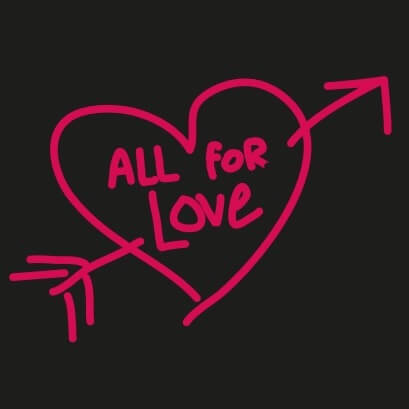 This year’s theme is, as Colin said, All FOR LOVE! After all, isn’t everything we do done for love? Opposites attract, and unlikely couples are often meant to be. Love is seldom effortless, and failure can be a part of the love. Every improviser knows this, and we are celebrating it! Let all aspects of love inspire your costume. Or get inspired by these lovely examples! THE BEST “ALLFORLOVECOUPLE” WINS A SURPRISE!! !